You can join City Tours Europe anytime - even in the evening and during the weekends. This is an important advantage if you happen to need a bus urgently - or if you have already booked a sightseeing bus tour or a bus transfer but have to face some unforeseen circumstances. You can speak English with the team of City Tours Europe and thus easily rent buses in any country, even if you cannot speak its national language. City Tours Europe allows you to pay your bus transfers and sightseeing tours anywhere in Europe by bank transfer to an Austrian or a German account, or by credit card. City Tours Europe enables you to book buses for sightseeing tours and bus transfers in one city or in several cities, for one single group or for several groups - all together and from the same company. This saves you a lot of time and makes the booking, planning, payment and accounting much quicker and easier. When you book your buses through City Tours Europe, you enjoy the high Austrian standards regarding guarantee and customer rights (payment security...). City Tours Europe's "frequent buyer effect"
If you book your bus via City Tours Europe, then the bus company in charge of your service does not regard you as just any standard customer that will never come back and is therefore not worth much trouble. On the contrary, you enjoy the status of a regular customer, for the bus company's direct customer is City Tours Europe - a customer from which they get contracts very regularly and who they would not like to lose! When choosing the bus companies we work with, we make a point of the good personal care of our customers in a friendly way - and for each one of our customers, we use our power as regular customers of the bus company. Therefore, if you book your bus from City Tours Europe, you can be sure to be treated like a regular customer all around Europe. How often do you think you would have to rent a bus - let's say in Sicily - so as to be regarded as a regular customer by the local company there? - Or in Stuttgart? Or in Graz? If you are neither a local company with a fix local partner nor a big, europe-wide active tour operator, then it is totally impossible to enjoy the regular customer advantages all around Europe - except, of course, if you book your bus with City Tours Europe! Kind of transportation service needed: do you need a charter bus for a bus transfer within one city? An airport transfer? A sightseeing bus tour? An excursion in the surroundings of a town? Any other kind of bus transfer or bus tour? Departure point: where exactly should your trip start? Ending point: where should your trip end? Preferred time and date: when should your bus transfer or sightseeing tour take place? Bus size: how many persons have to be transported? less than eight persons in a minibus? nine to twenty in a small bus? twenty-one to sixty persons in a motor coach? or even more in a double-decker bus? Itinerary or programme for the trip: does your bus transfer have to go through a specific itinerary, maybe with specific stops along the way? What should the programme for your sightseeing bus tour look like? 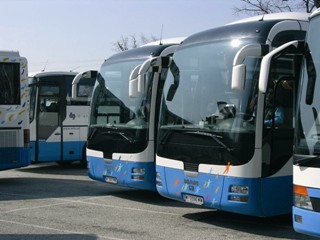 Additional services needed: what additional services do you need within the context of your bus transfer, sightseeing tour or excursion, outside the transportation service itself? Do you need a tour guide or a tour representative inside your vehicle? Should the group be welcomed by a hostess in the airport? Do you need a ski rack for a ski transfer? Or a bike rack? Special equipments suitable for the disabled? Do you have any special wish regarding the kind of vehicle and its equipment?